From Belfast to Bangkok, the musical maestro has played thousands of concerts all over the world, with a professional career spanning five decades. He is still touring even now and despite having lived in Switzerland for the past 40 years, he has never forgotten his roots. He developed a love of music from his parents, James and Ethel, and it was his uncle Joe who began teaching him how to play the flute at an early age. “The music business was in our family,” he said. He has worked with the London Symphony Orchestra, the Royal Philharmonic Orchestra and spent six years with the Berlin Symphony Orchestra before embarking on a solo career in 1975. Since then he’s sold 30 million records worldwide, and insists he has no intention of slowing down. Sir James said that his music career didn’t just happen overnight, and that he is a staunch believer in the power of preparation. “There is a great deal to be said for self-discipline, which goes a long way to bringing it to the front,” he said. Honoured with a knighthood in 2001, and having won a lifetime achievement prize at the Gramophone Awards in 2014, Sir James has been garlanded with dozens of top accolades throughout his career. However, he said that some awards have escaped even his grasp. “I never won a Grammy, but Elton John got one for a very nice flute solo he wrote for me,” he said. Even though he still plays concerts internationally, Sir James says that his passion now lies in music education – and that is the legacy he wants to leave behind. He teaches classes wherever he goes and has just returned from a tour of South Africa, where he had the chance to lead a master class with some students. “I consider myself a crusader,” he said. “That’s what we want to do. I’ve spent all these years in the battlefield, so to speak, and now I want to teach these kids how to fight. “Music gives you an extra colour in your education, when kids are learning music at school, it gives them their own voice. With his constant travelling, teaching and performing, one might wonder how the 75-year-old is still able to do it all, but by his side is his wife, Lady Jeanne Galway. “I don’t think I could have come as far without her help,” he said. The pair met when Galway was playing in New York in the late 1970s, shortly after he had split from his second wife Anna Renggli. They married soon after and live happily in Lucerne, Switzerland. Given the nickname of the man with the golden flute, Sir James now plays a specially-commissioned Nagahara worth about $28,000. 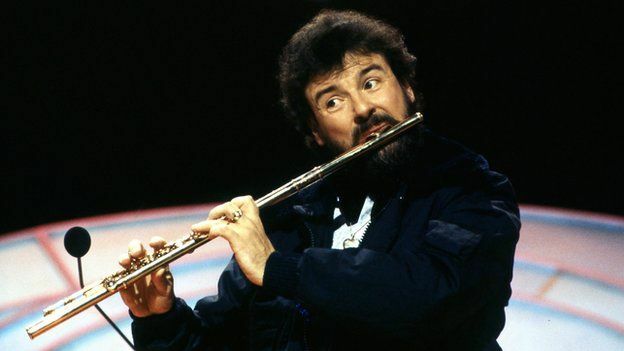 He is regarded not only as a world-class flautist, but a shining example of top Northern Ireland talent – and he said it is lamentable that the arts are not being prioritised in Belfast.